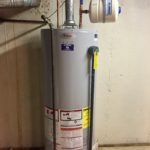 Many times I see water heater’s installed by unqualified handy men, or home owners that don’t realize the mechanical and technical aspects of heating water. First off your water heater’s of today in most homes are required to have an expansion tank. The only time this is not required is if you have well water with a pressure tank. All other water heater’s need an expansion tank. This tank is needed to take up thermal expansion that takes place when your water heater is doing it’s job, heating water. Many times I see water heaters installed without one of these, this will cause your relief valve to drip or even let large amounts of water out to relieve the unsafe pressure build up. This extra pressure is also putting a great deal of stress on your water heater tank it self. Many times home owners call and say “I need a new water heater, it’s leaking” but the relief valve is just blowing off leading them to believe it’s the tank leaking. After replacing the water heater doing this, the new one may also leak if the problem is not diagnosed properly. The temperature and pressure relief valves job is to let you know you have a problem with pressure or temperature that is not safe. So make sure you have an expansion tank on you cold water supply line preferably above the water heater. If you don’t get one installed it will save you in the end. And if your relief valve is leaking find out why.